The new Arundel Museum opened its doors in June 2013. Purpose built to high standards, the museum is well insulated, heated by an air-to-water heat-pump and has a passive ventilation system to provide fresh air during the day and night-time cooling during warm periods. Keen to ensure that they operate the building efficiently, and stay in command of utility consumption and costs, the museum invited the Sustainable Business Partnership CIC to carry out a Sustainability Site Visit, funded by the South East Museum Development Programme. The visit began with a review of energy, waste and water bills. The museum’s electricity contract had recently ended and rates increased. A phone call to their supplier and they were offered an improved tariff, reducing their annual bill by 10%, or £300. Waste and recycling collection costs had also crept up since 2013, after their original contractor was taken over by another provider. After obtaining quotes from three companies, the museum chose a service that reduced annual costs by £327. When comparing energy and waste prices, the museum made sure to take into account all standing charges and administration fees and based their decisions on the predicted total annual cost, rather than just the cheapest unit rate or lift charge. With the rapid development of LED lighting, even in the short time the museum had been open, there was an opportunity to upgrade halogen and tungsten lamps.Using a local supplier, the museum retrofitted 53 LED lamps; utilising the existing mains voltage track and fittings. The new lamps should save over 5,700 kWh per year, equivalent to £716 and 2.77 tonnes of CO2e. At £950 to purchase, they should pay for themselves in around sixteen months. A wide range of LED lamps and fittings are now available, and for larger projects, suppliers are often happy to let organisations trial different products before install. Acting on other recommendations from the site visit, the museum have fitted a timer to automatically switch off their water heater when not required and now only turn on equipment, such as the dishwasher, when needed, instead of each day at opening (a commercial dishwasher continuously uses energy to keep a wash tank pre-heated ready for a load). 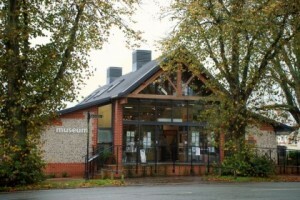 Arundel Museum’s environmental policy and initiatives have helped them achieve the Arts Council Accreditation Standard. To find out how your organisation can save money through resource efficiency contact the Sustainable Business Partnership CIC.